Washington D.C – February 13 2018: Axios Systems, a leading provider of IT Service Management (ITSM) and IT Operations Management (ITOM) solutions, is an official sponsor of Pink Elephant’s 22nd Annual International ITSM Conference & Exhibition – Pink18. 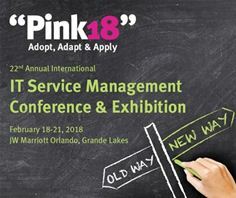 The event, which runs from February 18-21, will focus on introducing Integrated Service Management and feature exhibits from 26 IT vendors, as well as over 120 speaking sessions at the JW Marriott Grande Lakes in Orlando, Florida. Axios Systems, located at booth #206, will showcase features from the upcoming release of its leading ITSM solution, assyst, as well as the powerful capabilities of its integrated Asset Discovery (assystITOM) functionality to help manage services, assets and support in a single fit-for-purpose application. Conference topics will cover ITSM, ITIL®, Lean IT, Agile, Scrum, DevOps, Organizational Change Management and Business Relationship Management, with 12 tracks aimed at adapting, adopting and applying best practice. Some of the features that will be highlighted include enhancements to the Kanban boards, Change Advisory Board (CAB) monitors and Internal Feedback mechanisms. Providing businesses with a flexible and agile way to keep on top of changes, while providing transparency and built-in collaboration, means organizations can ensure resources are being used effectively. A premier global training, consulting and conference service provider, Pink Elephant has an undisputed reputation for leading the way. We’re proud of our pioneering and innovative spirit, which has enabled us to introduce and spearhead many revolutionary concepts and programs since our inception forty years ago. Visit http://www.pinkelephant.com for more information about our company, and our services and products.